Web application for exploring King County’s public art and heritage sites from any device. 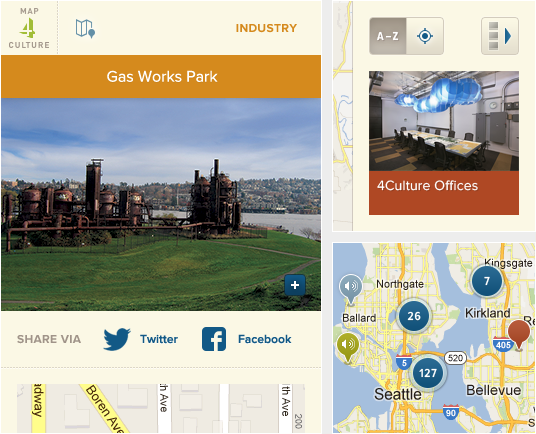 In early 2011 we worked with 4Culture to create a simple interactive map (based on an existing public art map) for King County’s heritage sites. These maps served their purpose well, but the idea had a lot of untapped potential. 4Culture approached us looking to make a number of improvements such as adding more detailed information for each site and creating an experience optimized for mobile users. Through our conversations we discovered additional ideas that would improve the user experience, such as: geolocation support for directions & sorting of the sites, social sharing buttons, and combining the public art and heritage sites on to a single map to expose visitors to a wider variety of content. Based on these needs and other requirements, we designed and implemented a robust web application that works across platforms and devices, responds to any screen size, and provides easy access to detailed information on over 120 cultural sites throughout King County.